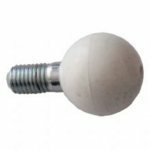 replacement ball joint for caravan awning poles. As used on Trio and Eurovent awnings. Rear lens to fit all Trigano trailer tents and the Randger 415DL folding camper. 4 section lens which screws to backing box with tail light, brake, fog light and indicator. Replacement pin used to set the height of the adjustable bed leg on most Trigano trailer tents. Stainless steel pin fits through the adjustment holes in the bed leg and locks in place to ensure the bed is level. Replacement ball joint plastic foot for the folding bed leg on most Trigano trailer tents. Complete foot consists of 1 x stem and ball to fit to the leg and 1 x wide round foot plate to prevent leg sinking in soft ground. Supplied as single complete foot. The Trigano Chantilly GL was one of Trigano's biggest selling trailertents. Large family awning with kitchen areas, toilet compartments and the ability to add a further 170 cm deep awning for even more space. The Trigano Galleon has quickly established itself as an ideal family trailertent. It has a quick erect 310 cm deep hooped awning and available with or without a rear mounted kitchen. Trigano also manufacture a weekend awning for this model which is ideal for a short weekend away. The Trigano Galleon has quickly established itself as an ideal family trailertent. It has a quick erect 310 cm deep hooped awning and available with or without a rear mounted kitchen. The Oceane was previously Trigano's entry level and best-selling family trailer tent and is now regularly available second hand. Made from the early 90's to 2008 there are slight differences in specification and features with each year. All Trigano Oceane were 4-berth Trailer Tents as standard with 2 double beds, a spacious awning and the option to upgrade to 8 berth with the addition of under-bed tents. The Trigano Odyssee is quick erect pram hood style trailer tent for upto 7 people using the optional annexe/underbed tent. Plenty of storage and under 30 mins fully erected make this a popular choice for weekends or longer holidays. Zip in groundsheet as standard. The Trigano Olympe is the largest pram hood style trailertent currently available. Quick erect in under 30 mins with practice yet flexible enough to sleep upto 8 in comfort. Zip in groundsheet as standard. The Trigano Olympe is the largest pram hood style trailertent currently available. Quick erect in under 30 mins with practice yet flexible enough to sleep upto 8 in comfort. Zip in groundsheet and cushioned cabin seating area comes as standard. Stainless steel S hooks used for attaching trailer covers, unberbed inner tents and hanging tent tidies.